A fun, fast-paced version of Bingo. Pull the Zinger forward to reveal 2 Mystery Tiles. Match the pictures and words to those on your cards. The first player with a full card wins and yells "Zingo!" Bingo with a Zing! In this fast-paced version of Bingo, kids pull the Zinger forward to reveal 2 Mystery Tiles, matching the pictures and words to those on their cards. The first player with a full card wins the game by yelling "Zingo!" Two levels of play and several game variations keep the zaniness going for hours! 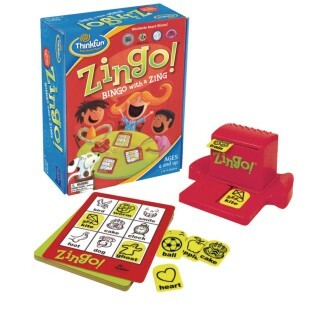 Includes 6 double-sided Zingo cards, 72 plastic picture tiles and tile dispenser. For 2 to 6 players, ages 4 and up. I've had this game at home for a couple of years and have played it with my two children currently ages 5 and 9. They both liked it and because it doesn't require reading kids of different ages could play at the same time. They love the tile dispenser. Great for kids 3 to 8.